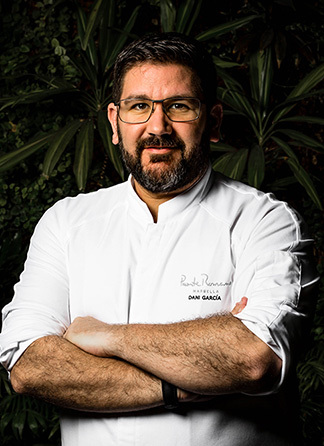 With three Michelin stars for his restaurant in the Marbella Hotel Puente Romano Beach Resort & Spa, and recognition in the 2016 Bib Gourmand (also from the Michelin Guide), Dani García has positioned himself as one of the Andalusian chefs with the most promising international career at this moment in time. A creative chef who never stops with almost 20 years of experience in the kitchen, his cooking is global and cosmopolitan, feeding off a multitude of influences: from his Andalusian roots, his experiences travelling around the world and from the cultures that he continues to discover, and from all his years of learning. He was trained at the Malaga Catering School “La Cónsula” – a benchmark in Andalusia, and in 1996 he started his career under the wing of Martín Berasategui, who he claims to share the “chef’s DNA” with. It is in these years that Dani confirmed his drive and passion for gastronomy, defined his style of cooking and choose the flavours that make up the common denominator of his cuisine. And it was Dani who defined himself as a “craftsman of flavour”, and as someone who is able to combine local product with the techniques and ingredients of more international cuisine. 2018　3rd Michelin star awarded to Dani García Restaurant Marbella. 2017　Prix Versailles award for the best decoration awarded to the BiBo Madrid restaurant. 2016　BiBo Marbella recognised in the Bib Gourmand. “Sánchez Cotán Award” from the Royal Academy of Gastronomy for the best menu design for BiBo Marbella and Madrid. 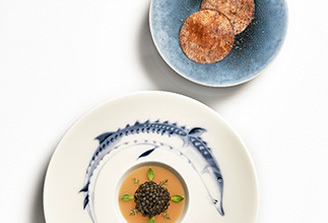 2015　Andalusia Gastronomy Prize awarded to Dani García. Member of Relais & Châteaux. 2014　Revalidates the 2 Michelin stars for the Dani García Restaurant at the Hotel Puente Romano. 2012　Best Cod Dish by Giraldo. “Cucharón del Buen Guiso Marinero 2012” (Golden Spoon for Best Seafood Stew) in Asturias. 2011　Andalusia medal awarded by the Governing Council of the Junta de Andalucía. Awarded Entrepreneur of the Year by the Diario SUR newspaper. IBERIA Airlines business class selects Dani García as their brand image. 2010　Name Ambassador of the city of Marbella by Marbella Town Hall. Award for Excellence in Management for the Gastronomy Project of the Junta de Andalucía Ministry of Tourism. Named Best Chef of the Year by popular vote by the Gourmetour Guide. 2nd Michelin star awarded to CALIMA. 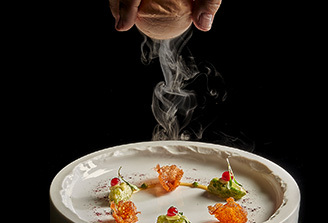 2009　National Gastronomy Award from the Royal Spanish Academy. Creative cuisine award for the blog Salsa de Chiles (ABC). Protagonista award from Spanish radio station Cadena COPE. 2008　3 Repsol Suns from the Repsol Guide given to CALIMA. Awarded Best Dish at the Best Gastronomy congress for the Raf Tomato Pipirrana with Green Gazpacho and Motril Prawns dish. Best Pastry Chef of the Year 2008. Best dressed table of the year 2008. Entrepreneur Award from the Andalucía Económica magazine. 2007　1st Michelin star awarded to the CALIMA restaurant in Marbella. 2 Repsol Suns from the Repsol Guide given to CALIMA. Young Malaga Prize for the international promotion of the Malaga province awarded by the Andalusian Youth Institute. 2006　Awarded the Chef L’Avenir (Chef of the Future) prize by the International Academy of Gastronomy. 2005　Technical Award of the Year given to Dani García and Raimundo García del Moral for their work with liquid nitrogen and gellan gum. Named Chef of the Year by Canal Cocina (Spanish cooking channel). Awarded Chef of the Year by the Lo Mejor de la Gastronomía (The Best Gastronomy) congress. 2004　Named Golden Chef by the Intxaurrondo Gastronomy Society. 2002　Périgueux Prize (France) awarded to the Tragabuches book for best editorial design. Best Chef of the Year. Recognition from the Malaga Gastronomy Academy. 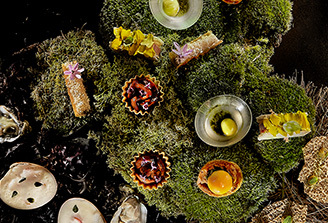 2001　Prize for the Best Gastronomy Work in Malaga, awarded by the Diario Sur newspaper. 2000　First Michelin star in the Tragabuches restaurant.